Form No. 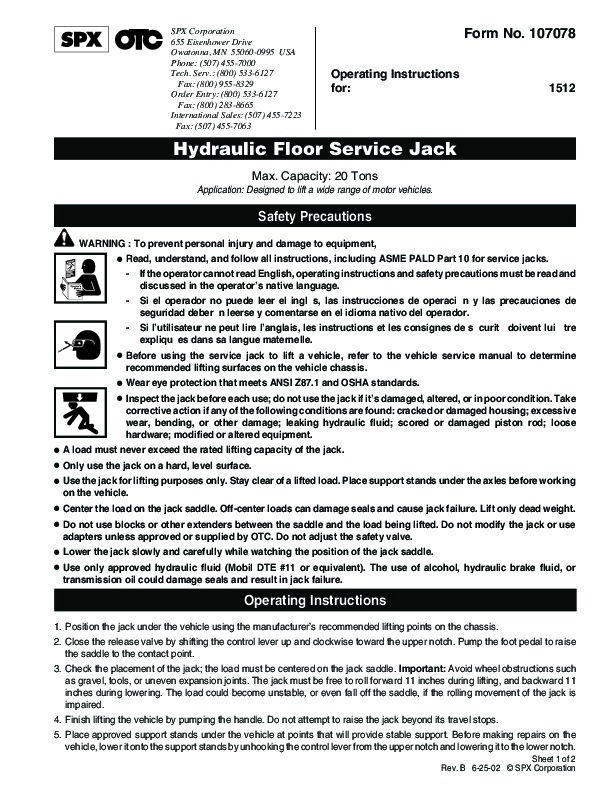 107078 Operating Instructions for: 1512 Hydraulic Floor Service Jack Max. Capacity: 20 Tons Application: Designed to lift a wide range of motor vehicles. 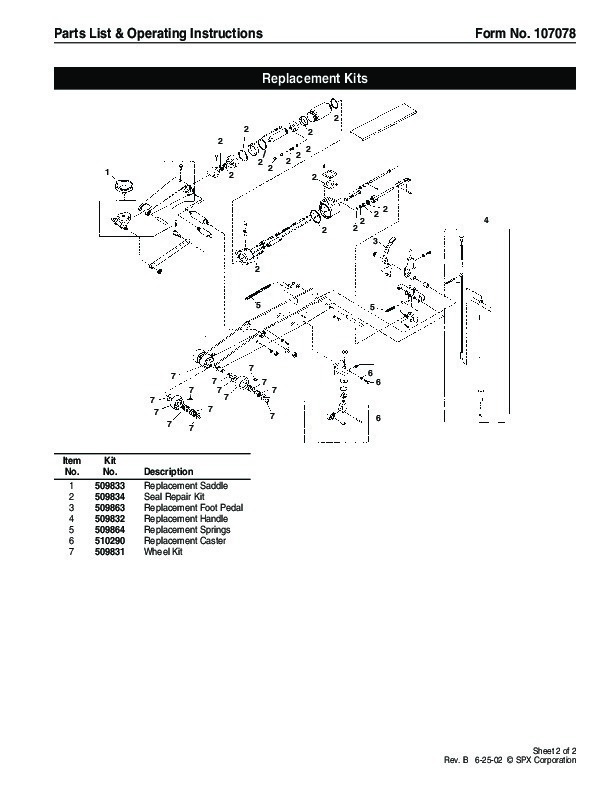 Safety Precautions WARNING : To prevent personal injury and damage to equipment, · Read, understand, and follow all instructions, including ASME PALD Part 10 for service jacks. If the operator cannot read English, operating instructions and safety precautions must be read and discussed in the operator’s native language. Si el operador no puede leer el inglés, las instrucciones de operación y las precauciones de seguridad deberán leerse y comentarse en el idioma nativo del operador. Si l’utilisateur ne peut lire l’anglais, les instructions et les consignes de sécurité doivent lui être expliquées dans sa langue maternelle. · Before using the service jack to lift a vehicle, refer to the vehicle service manual to determine recommended lifting surfaces on the vehicle chassis. · Wear eye protection that meets ANSI Z87.1 and OSHA standards. · Inspect the jack before each use; do not use the jack if it’s damaged, altered, or in poor condition. Take corrective action if any of the following conditions are found: cracked or damaged housing; excessive wear, bending, or other damage; leaking hydraulic fluid; scored or damaged piston rod; loose hardware; modified or altered equipment. · A load must never exceed the rated lifting capacity of the jack. · Only use the jack on a hard, level surface. · Use the jack for lifting purposes only. Stay clear of a lifted load. Place support stands under the axles before working on the vehicle. · Center the load on the jack saddle. Off-center loads can damage seals and cause jack failure. Lift only dead weight. · Do not use blocks or other extenders between the saddle and the load being lifted. Do not modify the jack or use adapters unless approved or supplied by OTC. Do not adjust the safety valve. · Lower the jack slowly and carefully while watching the position of the jack saddle. · Use only approved hydraulic fluid (Mobil DTE #11 or equivalent). The use of alcohol, hydraulic brake fluid, or transmission oil could damage seals and result in jack failure. Operating Instructions 1. Position the jack under the vehicle using the manufacturer’s recommended lifting points on the chassis. 2. Close the release valve by shifting the control lever up and clockwise toward the upper notch. Pump the foot pedal to raise the saddle to the contact point. 3. Check the placement of the jack; the load must be centered on the jack saddle. Important: Avoid wheel obstructions such as gravel, tools, or uneven expansion joints. The jack must be free to roll forward 11 inches during lifting, and backward 11 inches during lowering. The load could become unstable, or even fall off the saddle, if the rolling movement of the jack is impaired. 4. Finish lifting the vehicle by pumping the handle. Do not attempt to raise the jack beyond its travel stops. 5. Place approved support stands under the vehicle at points that will provide stable support. Before making repairs on the vehicle, lower it onto the support stands by unhooking the control lever from the upper notch and lowering it to the lower notch. Sheet 1 of 2 Rev. B 6-25-02 SPX Corporation Operating Instructions Form No. 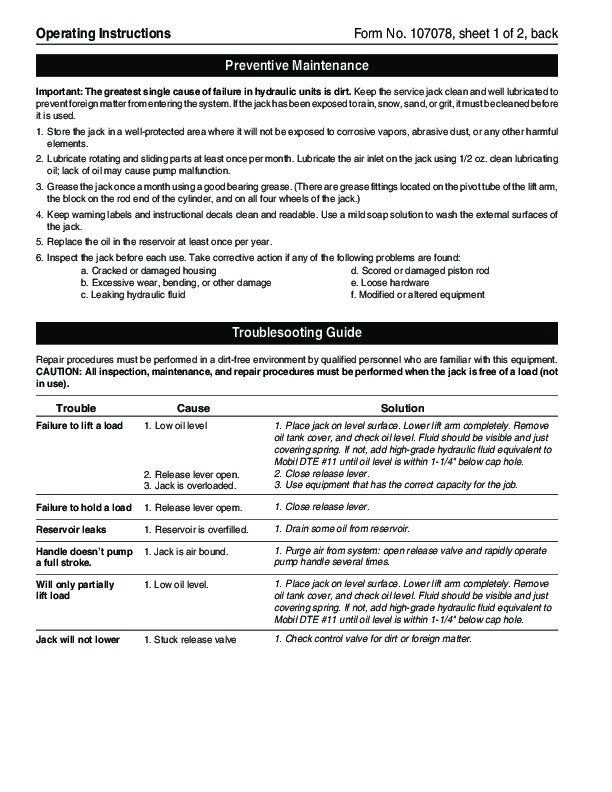 107078, sheet 1 of 2, back Preventive Maintenance Important: The greatest single cause of failure in hydraulic units is dirt. Keep the service jack clean and well lubricated to prevent foreign matter from entering the system. If the jack has been exposed to rain, snow, sand, or grit, it must be cleaned before it is used. 1. Store the jack in a well-protected area where it will not be exposed to corrosive vapors, abrasive dust, or any other harmful elements. 2. Lubricate rotating and sliding parts at least once per month. Lubricate the air inlet on the jack using 1/2 oz. clean lubricating oil; lack of oil may cause pump malfunction. 3. Grease the jack once a month using a good bearing grease. (There are grease fittings located on the pivot tube of the lift arm, the block on the rod end of the cylinder, and on all four wheels of the jack.) 4. Keep warning labels and instructional decals clean and readable. Use a mild soap solution to wash the external surfaces of the jack. 5. Replace the oil in the reservoir at least once per year. 6. Inspect the jack before each use. Take corrective action if any of the following problems are found: a. Cracked or damaged housing d. Scored or damaged piston rod b. Excessive wear, bending, or other damage e. Loose hardware c. Leaking hydraulic fluid f. Modified or altered equipment Troublesooting Guide Repair procedures must be performed in a dirt-free environment by qualified personnel who are familiar with this equipment.